How Can A Humidifier Benefit You? Your home is the central location in your life. It’s where you’ll go everyday to eat, to sleep, and to unwind from the day. Because of its central position in your life, your home should be nothing short of the most comfortable and healthiest place in your life. But just what can you do to ensure that your home is as comfortable and as healthy as it needs to be? Among the many steps you can take in this endeavor, having a humidifier installed in your home is one of the best. And why is that? Why, for a variety of reasons! Unsure what those reasons are? No big deal: Just read on! 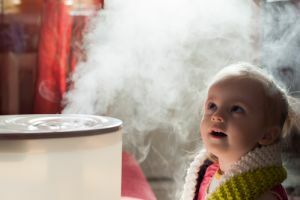 Our quick list of some of the ways in which a humidifier benefits both you and your home should elucidate you to some of the reasons why you shouldn’t go another day without a humidifier! Is there anything more uncomfortable than dry sinuses? Well, quite a few things, probably. But dry sinuses are up there. If the thought of waking up to tight, scratchy, congested sinuses is an unpleasant one to you, then the thought of avoiding that headache is surely an inviting one. And with a humidifier, you can help to avoid sinus issues that are related to dry air. Dry, scratchy sinuses are a problem that affect only you (unless you’re a loud complainer anyways). But snoring affects everyone who has to sleep within earshot of you. If your significant other is pretty significantly annoyed by your snoring, then a humidifier will prove to be just the thing to stop the snoring and keep your relationship sturdy. A humidifier will moisten your throat, alleviating the worst of your snoring. Healthier you, happier significant other: What’s not to love? Dry air is no good for your skin. It deprives it of its much-needed hydration, resulting in skin that looks tired and feels uncomfortable. If you want skin that GLOWS and that also feels GREAT (not cracked or dehydrated), then just get a humidifier! A humidifier will do wonders for your skin as it provides you with the moisture needed to encourage healthy skin! These are just three of the great reasons why you should get a humidifier in your home! If you now believe that a humidifier is the best thing for your home and you, then don’t hesitate to call up the Kansas City heating and air conditioning pros at Ultra Heating and Cooling LLC for a quality humidifier installation today! Your home should be the most comfortable and healthiest place in your life, and with a humidifier installed by Ultra Heating and Cooling LLC, you can be sure that it will be just that!